This is the second post in my Blogging to My PhD series, where I read the books from my exam list and write about them through a contemporary/not strictly academic lens. This post is late, but I finished the book on time, so I'm calling it a success. This week I read Isocrates Against the Sophists. This text is a fragment and is thought to be a portion of a longer piece that was used to advertise Isocrates' services as a teacher of rhetoric. He identifies himself as a Sophist, but he is working to set himself apart from those other Sophists who were garnering a bad reputation for their pedagogical practices. The portion of the text that remains is largely an attack on those other methods and it's thought that the piece that is missing did more to lay out Isocrates' own methods. Still, we get some hints at what framed his teaching philosophy, and it was these hints that interested me most. It paradoxically both saddens me and gives me hope that the "lay-public" has been disenchanted with education since Isocrates' time. It saddens me because it suggests a disconnect between education's potential and its actualization. Today's educational problems are not necessarily new, but contemporary manifestations of ancient problems. But that also gives me hope. It means that the problems of our educational circumstances are not a sign of our urban plight or our dwindling intelligence. They're problems of relationships, indicators of larger social issues, and things that we can begin to address if we look at them through the right lens. And the lay-public is definitely crashing down on education today. Between the recent Chicago teacher strike, the absolutely dismal outlook for many (especially urban) public schools cataloged in films like Waiting for Superman and the newly released Won't Back Down and playing out in courtroom battles, and the recent presentation of traditional liberal arts education in pop culture as hopeless, education is taking some punches from the public. I'm hoping to go see Won't Back Down sometime this week. I've read a lot of criticism of how it scapegoats teachers without addressing the other issues causing problems in the education system. I know that teachers are not the whole problem. In fact, I don't think anything is the whole problem except the whole problem and--as I've written before--the longer we shift the blame from group to group, the more students get lost in the shuffle. So we all need to take some blame, and we all need to work toward a solution. All of us: teachers, parents, politicians, city residents, administrators, test writers. And Isocrates suggests that the way we can start doing that is to stop "making greater promises than [we] can possibly fulfill," which means taking a realistic look at what we can accomplish today and what we want to accomplish tomorrow. 1) Make no promises about what you're teaching that you cannot keep. 2) Judge your own abilities to teach by the level of trust you can put into your own students to do what you taught them. That means that we must gauge our educational goals not by what would happen if we had "ideal" students, but by teaching the students we actually have. It also means that we need to remember that those students we're turning out into the world trust us. They trust us to prepare them for what lies ahead, and if we turn out students whose abilities we do not believe in ourselves, we have failed. 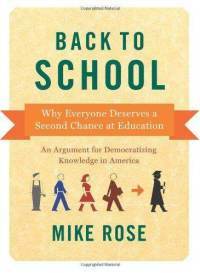 Immediately after finishing Against the Sophists, I started reading Mike Rose's new book Back to School (you can read an excerpt from his blog here). In this book, Rose looks at what he calls "second chance" institutions: community colleges and literacy programs that give students who have fallen through the cracks another chance to attain their educational goals. I'm about half of the way through, and I find it really inspiring. Rose is talking about the students that I encounter every day as a community college teacher: students who have left lives of crime to do something better, students who have been incarcerated for drug use, students who work multiple jobs and squeeze their education in when they can, single parents who struggle to take one class a semester in order to move forward with their plans, veterans who haven't been in school for two decades, recent high school graduates whose test scores kept them from getting accepted to a four-year college. These students are often not who we have in mind if we imagine the "ideal" student, but the ideal student does not exist. We teach people, not caricatures, and we teach them from where they are, not where we'd like them to be. His book is digging into the stories of these students in order to question the assumptions that surround them and the educational policies that are put in place on top of those assumptions. The problem is that these second-chance institutions are not living up to their promise, and the current political climate poses threats to their improvement and, in some cases, to their continued existence. So, there it is again: Isocrates' threat. If we promise what we cannot deliver, the lay-public will turn against us. Another way to explain away inequality--one that has a long history in the United States and is still very much with us--is the moral argument. People are at the lower end of the economy because of a failure of character; they engage in counterproductive behavior, lack a work ethic, don't complete things, and so on. They are a drain on the system, gaming it, on the dole . . . some conservatives would be surprised to see first-hand the work ethic, the lack of excuses for previous bad behavior and blunders, the self-reliance, multiple responsibilities, and schedules of the people who populate this book. . . He goes on to say that the way we frame the lives of these "second-chance" students are "accounts of hardship with almost no feel of hardship to them." If we allow our students to be framed as lazy and morally lacking, then how can we possibly adhere to Isocrates' second principle by assuring that we are sending forth students who we would trust ourselves? If we allow the mainstream narrative surrounding their ability to succeed to be dominated by statistics on their failures, what kind of trust are we demonstrating? If we are to succeed as second-chance (or first-chance) educational institutions, we'd do well to keep Isocrates' two principles in mind. We need to make promises we can keep, so we need to examine how we pick which promises to make. Then we need to make sure that we're sending into the world students who have received the promises we've kept, students we can trust with the skills we've given them.